Nigeria: Military At The Door? Sustained good governance in Nigeria appears to be near impossible. Few countries in the world have been so unblessed with bad political leadership as Nigeria has in her post-colonial history. When Nigeria returned to democratic civilian rule in 1999, after a decade and a half of military dictatorships, people were hopeful that much anticipated change had finally come. Well, some change did come but by 2007, a constitutional crisis ensued, when then president, Olusegun Obasanjo, decided to extend his stay in power—an attempt that failed. 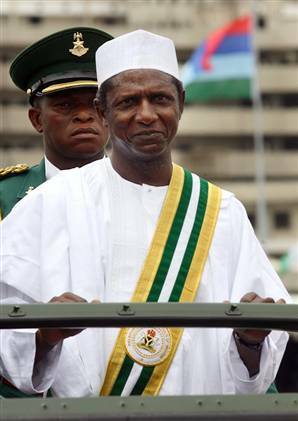 Mr. Obasanjo then handed over to Nigerians an obscure governor, Umaru Yar'adua, as their future president. The phrase "handed over" is used to denote the fact that though Nigeria is, constitutionally, a democratic state, the results of elections at the Federal level of government were pre-determined by the ruling People's Democratic Party. This column was not only surprised by an impending Yar'adua presidency but also taken aback. In the last post on this issue (Between the Devil and the Deep Blue Sea, posted in December 2006), Nigerians were urged to reject Mr. Yar'adua given that he was largely untested and was reported to be suffering from a terminal illness. Whether or not they eventually did was irrelevant. Yar'adua became the president of Nigeria at Mr. Obasanjo's and the ruling party's behest. And that precisely is when the nightmare began. Mr. Yar'adua is undoubtedly a very ill man. Media reports of his illness appeared not only to be very true but also to have been underestimated. Since assuming office as president of Nigeria, he has made a number of trips outside the borders of Nigeria for treatment, cancelling strategically important official functions and trips. Now, this should normally not be an issue as he is only human and bound to fall ill once in a while. But this is no normal situation. His last trip has seen him away from Nigeria for almost 40 days, with no word on who exactly is running the country. There has been a veil of secrecy around Mr. Yar'adua's illness with some online rumors claiming that his in a coma, and others that he is in intensive care. His personal physician did however state that he was suffering from acute pericarditis — an inflammation of the lining around the heart, but only after it became impossible to hide the fact that he was very ill and also around the time he was last flown to Saudi Arabia for treatment. Apart from this, not a single high-ranking Federal government official in Nigeria has been able to come forward and explain the state of the president, what his response to treatment is like and who happens to be running the country in his absence. The secrecy surrounding Mr. Yar'adua's illness hints at an impending end of his presidency. Political schemers are undoubtedly very busy, working behind the scenes on how and when this end should be brought about, given that, from all indications, Mr. Yar'adua is incapacitated and unable to function. Even if he does eventually recover, resuming full duties, as President, may be near impossible and he would likely be pressurized to step down. Mr. Yar'adau's illness has placed Nigeria on its latest constitutional crisis. He was meant to appoint a new Chief Justice of Nigeria before the 31st of December 2009. Unable to do this, the constitution, it appears was breached, with the outgoing Chief Justice appointing his successor. This appointment has been rejected by certain fractions in the Nigerian judiciary. Mr. Yar'adua's vice, Jonathan Goodluck, has refused to assume presidential powers, probably out of fear of offending Yar'adua and ruling party loyalists. But, given the recent foiled airline attack by a Nigerian citizen in the United States, Mr. Goodluck was left with no choice but to dish out executive orders in regard to full cooperation with the United States. If Mr. Yar'adau remains outside the shores of Nigeria much longer, be not surprised if even more constitution crises emerge. So much is required to be done now, with presidential approval. An accumulation of constitutional crises would likely have one inevitable end—the intervention of the Nigerian military. The Nigerian military may appear weakened but, be not fooled. The military would likely tolerate only so much "nonsense" from the ruling civilian political class. And if the military were ever forced to intervene, politicians would have only themselves to blame. For now though, the show goes on. Chippla Vandu is a Nigerian scientist and researcher based in Holland. He blogs as Chippla.